West Africa meets East Africa on the grand stage of AFRIMMA 2017 Awards & Music Festival as the duo of Basketmouth and Chipukeezy are announced as hosts of the biggest African music awards in Diaspora. 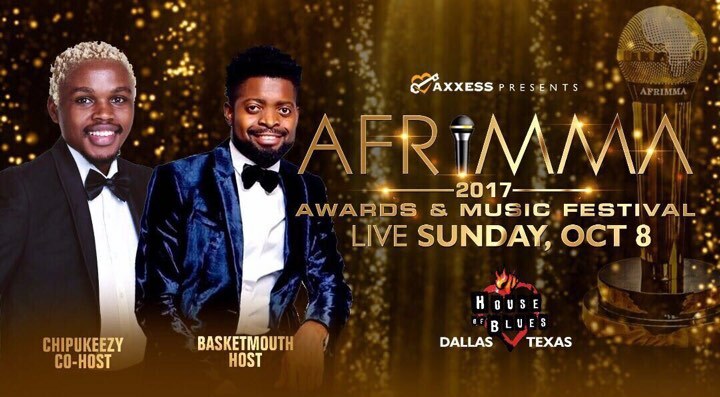 Africa’s top comedian Basketmouth returns as AFRIMMA host for the fourth year running after doing such an impressive job on the previous editions of the prestigious awards. Joining Basketmouth on the AFRIMMA grand stage is the effervescent Kenyan comedy sensation Chipukeezy whose profile has been on the rise in East Africa and currently one of the top acts from that region of Africa. It promises to be an exciting time with these two stars as AFRIMMA 2017 Awards & Music Festival brings you the best of both worlds in West African and East African comedy stars. Save the date as the countdown is on to October 8th, 2017as African music is celebrated on a global pedestal.